Recently, while preparing for the release of my new book, I went back to clean up and update some details in my previous books. 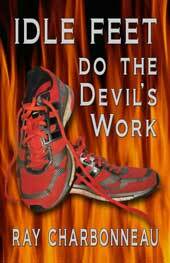 One of the things I took care of was a tiny detail on the front cover of Idle Feet Do the Devil’s Work. The first person to identify what it was that I fixed wins a free copy of Idle Feet! You may have to poke around the internet to find an old cover to compare it with, but that shouldn’t be hard. Enter in the comments below. What new book? Don’t miss any news – sign up for my email list, follow my RSS feed, or follow me on Facebook or Twitter! The flames now go through the “Do” and the “the”. That’s not it, Scott. What you mentioned is an artifact of the compression process. However, I expect that if you look closely at that same image, you can find the real answer. When you see it, it’ll be obvious. Actually, when I look back, there appear to be two versions of the cover with the mistake, one with less fire between the “Do” and the “the”. As I mentioned, that’s not the mistake, but it is a difference, so to be fair, I’ll give you a digital copy of the book. How’s that? The tongue of the shoe, or maybe it’s just a gap created by the shoelace, was changed from white to black/flame? Bradley, I’ll be in touch via email regarding your prize. Thanks to everyone who participated! Haha why thank you very much!